We are implementing a few changes to pit access during race events beginning this weekend and ask your help to assure the new processes are as effective as possible. The overarching goal is to maintain control of access to the pit area for insurance purposes. This isn’t about generating revenue by selling pit passes. Rather, it is about assuring insurance coverage and protecting the club’s assets in the event of an injury. We will close access to the pits during the drivers’ meeting at 8:45AM – the pit gate at the highway will be closed and the pit gate at the restrooms will be closed. These gates will remain closed until the final race of the day. All tow and personal vehicles must be parked in the east (back) lot. Vehicle access to and from the east lot will be through the north gate at the highway. Access to the restrooms from the pit area will be through the gate at the south side of the snack shack. You will need to show your pit pass wristband to re-enter at the snack shack gate. 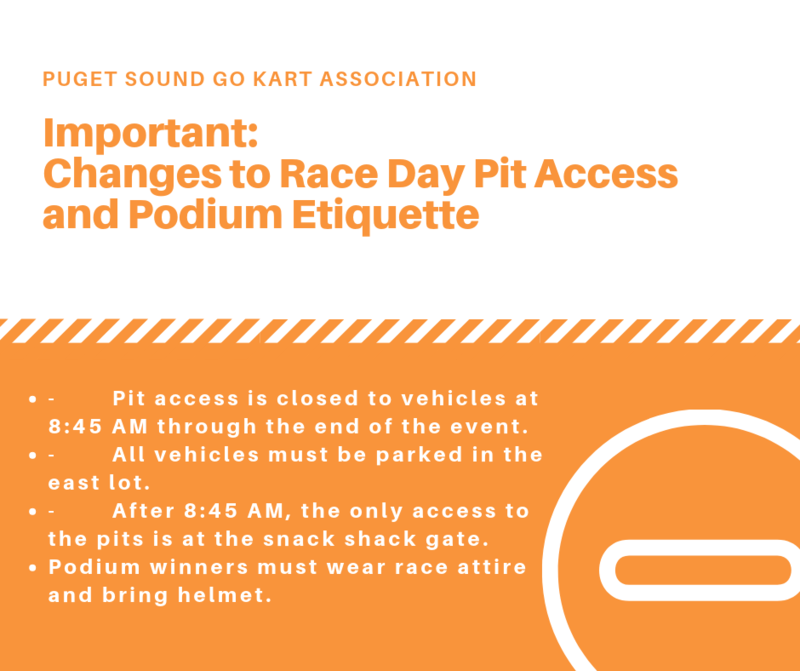 Pit access is closed to vehicles at 8:45 AM through the end of the event. All vehicles must be parked in the east lot. After 8:45 AM, the only access to the pits is at the snack shack gate. Thanks in advance for supporting us in making these changes. Hello again PSGKA racers. Beginning with the race this coming Sunday, we would like all drivers appearing on the podium to wear their racing suit and bring their helmet. This gives a more professional appearance and is a courtesy to drivers who would like a professional podium image to share with friends, family, and sponsors.